Google has announced Project Loon, an experiment to use balloons aloft at about 60,000 feet / 20 km to provide broadband wireless Internet service to the hinterlands. The Loon moniker is somewhat of an admission that the project is a bit crazy and a play on the word balloon, but it does have a sound technological foundation. The technology is much cheaper than satellites and naturally easier to launch. The experiment is beginning this month with the launch of a handful of balloons from New Zealand which will orbit about the 40th parallel and navigate around New Zealand using varying direction and magnitude air currents at various levels. Beta testers have been selected in New Zealand to try out the system. The idea of using aircraft to provide wireless services isn’t new, and radio amateurs have been launching experimental balloons with radios for quite awhile although recently there has been an upshot in interest. Google is known for using open source software and contributing open source technology back to the community. 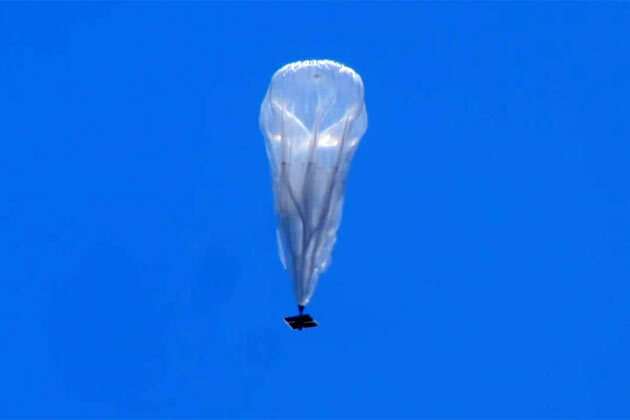 I’m curious if Google will open source the hardware, perhaps enabling amateur radio to benefit with its own balloon network similar to this someday. Current typical amateur radio balloon missions last only a few days. Having several balloons aloft could perhaps be an alternative to satellites which are becoming increasingly expensive and difficult to launch. The Project Loon site has a nice video detailing the project here. Many great things started out as “crazy” ideas. Google says the research is designed to learn how to deploy emergency communications networks in times of natural disasters.